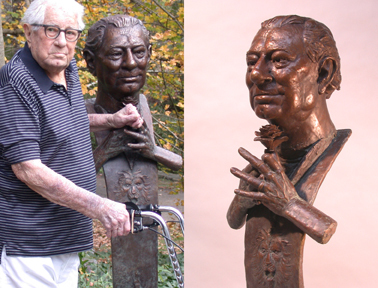 2003, Bronze, over life-size, commissioned. Gil Guillory's family commissioned the sculptor to imagine and sculpt this work. The goal was to capture the spirit and character of the man when he was about fifteen years younger. Still lucid and with a great sense of humor, Gil posed for this work while at the age of 98. Known to be quite a charmer with the ladies but a lion at heart, this work captures the wide spectra of his rare personality.